First off, why would you want to do this? A Google Plus icon (like the red button above) will show in your contact information at the bottom of every itinerary you create--and, if your customers are Google+ users as well, they might add you to their circles and get you connected to more potential customers. When your itineraries show up in Google Search results, your photo from your Google+ profile page will be displayed next to your itinerary. It's very likely that this will be the ONLY website on the page of results that has a person's photo next to it, so it really makes it stand out...thus users are more likely to click on it and look at your itinerary. OK, you've convinced me...what do I do next? First, do you have a Google account (a GMail account will do just fine)? If not, click here to get a free one. The next step is to create your Google+ profile page. This is different from your Google Account (although it will be connected to your Google account). 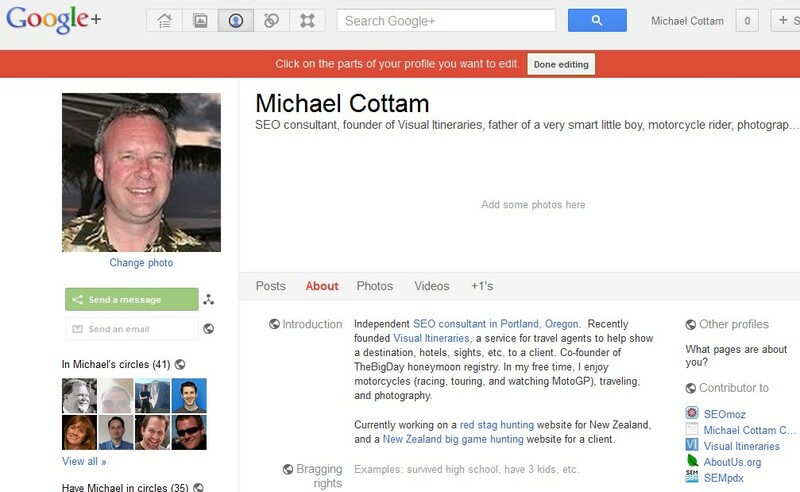 Your Google+ profile page is like your Facebook profile (except it's from Google, of course). Create a Google+ profile page here. added a link to your website (it's a free extra link to your site, which helps you get found in Google). Your profile should look something like Michael's, shown below (see "Visual Itineraries" at the bottom right, under "Contributor to"? And see the little "VI" icon next to it? ).